Rapid test to distinguish hematuria from hemoglobinuria. The onset of red urine during or shortly after a blood transfusion may represent hemoglobinuria (indicating an acute hemolytic reaction) or hematuria (indicating bleeding in the lower urinary tract). 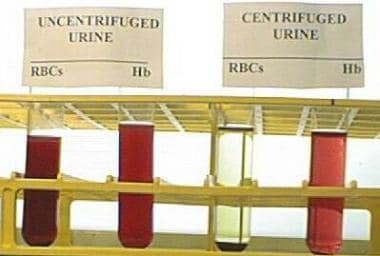 If freshly collected urine from a patient with hematuria is centrifuged, red blood cells settle at the bottom of the tube, leaving a clear yellow urine supernatant. If the red color is due to hemoglobinuria, the urine sample remains clear red after centrifugation. Transfusion reactions require immediate recognition, laboratory investigation, and clinical management. If a transfusion reaction is suspected during blood administration, the safest practice is to stop the transfusion and keep the intravenous line open with 0.9% sodium chloride (normal saline). A clerical check of the information on the blood unit label and the patient's identification should be performed to ensure that the "right" blood unit was administered to the "right" patient. In most cases, the residual contents of the blood component container should be returned the blood bank, together with a freshly collected blood sample from the patient, and a transfusion reaction investigation should be initiated. Acute transfusion reactions may present in complex clinical situations when the diagnosis requires distinguishing between a reaction to the transfused blood product and a coincidental complication of the illness being treated that occurs during or immediately after a blood transfusion. For patient education information, see the Blood Transfusions Directory and Blood in the Urine. TRALI has two proposed pathophysiologic mechanisms: the antibody hypothesis and the neutrophil priming hypothesis. [8, 9] Both mechanisms lead to pulmonary edema in the absence of circulatory overload. The neutrophil priming hypothesis does not require antigen-antibody interactions and occurs in patients with clinical conditions that predispose to neutrophil priming and endothelial activation such as infection, surgery, or inflammation. Bioactive substances in the transfused component activate the primed, sequestered neutrophils, and pulmonary endothelial damage occurs. Nonhemolytic febrile transfusion reactions are usually caused by cytokines from leukocytes in transfused red cell or platelet components, causing fever, chills, or rigors. In the transfusion setting, a fever is defined as a temperature elevation of 1º C or 2º F. A nonhemolytic transfusion reaction is a diagnosis of exclusion, because hemolytic and septic reactions can present similarly. Approximately 3 months is required for a patient to produce detectable levels of antibody after first exposure to a foreign red blood cell (RBC) antigen through transfusion or pregnancy. If no additional RBC antigen stimulus occurs, the antibody can become undetectable in 50% of patients within 5 years. Following renewed exposure to the same antigen, a more rapid antibody response can occur from 3 to 21 days later. Peak antibody production usually occurs between 7 and 10 days after exposure. Transfused RBCs containing the antigen undergo extravascular hemolysis by the reticuloendothelial system of the spleen and liver over a period of several hours to days. TRALI: Although uncommon, TRALI was the most frequent cause of acute transfusion fatality reported to the US Food and Drug Administration (FDA) from fiscal years 2008 through 2012, accounting for 37% of deaths. Early and intensive pulmonary support reduces the risk of a fatal outcome. No long-term morbidity has been described in survivors. Circulatory (volume) overload: Outcome varies with the overall clinical status of the patient. No long-term sequelae occur. Acute hemolytic reactions (antibody mediated): Most severe and fatal reactions result from inadvertent transfusion of group AB or group A red cells to a group O recipient. Renal failure and disseminated intravascular coagulation (DIC) are potential complications for patients who survive the initial acute reaction. Mortality increases directly with the volume of incompatible blood that was transfused. Acute hemolytic reactions (non–antibody-mediated) are typically benign; these include mechanical hemolysis of serologically compatible RBCs due to freezing, pressure infusion pumps, and osmotic hemolysis. Transfusion of serologically compatible but hemolyzed red cells results in acute hemoglobinemia and hemoglobinuria. Rarely, short- or long-term complications occur. Nonhemolytic febrile reactions are discomforting but typically benign. Occasionally, patients may have rigors, nausea, vomiting, and considerable distress. Patients who develop fever associated with a blood transfusion must be monitored carefully until the possibility of bacterial contamination of the blood product is excluded. Allergic reactions are typically benign but bothersome to recipients. Occasionally, allergic reactions may progress from pruritus and hives to bronchospasm and a generalized reaction, but such events are uncommon. Multiparous women may form alloantibodies to leukocyte, red cell, or platelet antigens as the result of an overt or inapparent fetal-maternal hemorrhage. Women who form leukocyte antibodies following pregnancy are more likely to have febrile, nonhemolytic transfusion reactions if subsequently transfused with leukocyte-containing blood components. Multiparous women who form IgG red cell alloantibodies may experience delays while serologically compatible red cells are located for future transfusions. Undetected weak IgG alloantibodies are unlikely to cause acute hemolytic reactions, but they may cause shortened survival of the transfused incompatible red cells. Because newborns do not form antibodies to ABO blood group antigens (anti-A, B, or AB) during the first few months of life (ie, infants do not form anti-A or anti-B until 3-4 months after birth), acute ABO-related transfusion reactions are not observed in this age group. The presence of any transplacentally transferred maternal IgG anti-A, B, or AB is unlikely to cause a clinically significant reaction. Most blood transfusions are administered to persons aged 60 years and older; therefore, most acute transfusion reactions also occur in this age group. Frazier SK, Higgins J, Bugajski A, Jones AR, Brown MR. Adverse Reactions to Transfusion of Blood Products and Best Practices for Prevention. Crit Care Nurs Clin North Am. 2017 Sep. 29 (3):271-290. [Medline]. Yeh SP, Chang CW, Chen JC, Yeh WC, Chen PC, Chuang SJ, et al. A well-designed online transfusion reaction reporting system improves the estimation of transfusion reaction incidence and quality of care in transfusion practice. Am J Clin Pathol. 2011 Dec. 136(6):842-7. [Medline]. Fastman BR, Kaplan HS. Errors in transfusion medicine: have we learned our lesson?. Mt Sinai J Med. 2011 Nov-Dec. 78(6):854-64. [Medline]. Squires JE. Risks of transfusion. South Med J. 2011 Nov. 104(11):762-9. [Medline]. Habibi A, Mekontso-Dessap A, Guillaud C, Michel M, Razazi K, Khellaf M, et al. Delayed hemolytic transfusion reaction in adult sickle-cell disease: presentations, outcomes, and treatments of 99 referral center episodes. Am J Hematol. 2016 Oct. 91 (10):989-94. [Medline]. [Full Text]. de Montalembert M, Dumont MD, Heilbronner C, Brousse V, Charrara O, Pellegrino B, et al. Delayed hemolytic transfusion reaction in children with sickle cell disease. Haematologica. 2011 Jun. 96 (6):801-7. [Medline]. [Full Text]. Keller-Stanislawski B, Lohmann A, Günay S, Heiden M, Funk MB. The German Haemovigilance System-reports of serious adverse transfusion reactions between 1997 and 2007. Transfus Med. 2009 Aug 31. [Medline]. Silliman CC. The two-event model of transfusion-related acute lung injury. Crit Care Med. 2006 May. 34(5 suppl):S124-31. [Medline]. Silliman CC, Curtis BR, Kopko PM, et al. Donor antibodies to HNA-3a implicated in TRALI reactions prime neutrophils and cause PMN-mediated damage to human pulmonary microvascular endothelial cells in a two-event in vitro model. Blood. 2007 Feb 15. 109(4):1752-5. [Medline]. [Full Text]. Curtis BR, McFarland JG. Mechanisms of transfusion-related acute lung injury (TRALI): anti-leukocyte antibodies. Crit Care Med. 2006 May. 34(5 suppl):S118-23. [Medline]. Skeate RC, Eastlund T. Distinguishing between transfusion related acute lung injury and transfusion associated circulatory overload. Curr Opin Hematol. 2007 Nov. 14(6):682-7. [Medline]. Fadeyi EA, De Los Angeles Muniz M, Wayne AS, et al. The transfusion of neutrophil-specific antibodies causes leukopenia and a broad spectrum of pulmonary reactions. Transfusion. 2007 Mar. 47(3):545-50. [Medline]. Vlaar AP, Juffermans NP. Transfusion-related acute lung injury: a clinical review. Lancet. 2013 Sep 14. 382 (9896):984-94. [Medline]. Gajic O, Gropper MA, Hubmayr RD. Pulmonary edema after transfusion: how to differentiate transfusion-associated circulatory overload from transfusion-related acute lung injury. Crit Care Med. 2006 May. 34(5 suppl):S109-13. [Medline]. Ness P, Creer M, Rodgers GM, Naoum JJ, Renkens K, Voils SA, et al. Building an immune-mediated coagulopathy consensus: early recognition and evaluation to enhance post-surgical patient safety. Patient Saf Surg. 2009 May 22. 3(1):8. [Medline]. [Full Text]. Capon SM, Goldfinger D. Acute hemolytic transfusion reaction, a paradigm of the systemic inflammatory response: new insights into pathophysiology and treatment. Transfusion. 1995 Jun. 35(6):513-20. [Medline]. Davenport RD. The role of cytokines in hemolytic transfusion reactions. Immunol Invest. 1995 Jan-Feb. 24(1-2):319-31. [Medline]. Sandler SG, Berry E, Ziotnick A. Benign hemoglobinuria following transfusion of accidentally frozen blood. JAMA. 1976 Jun 28. 235(26):2850-1. [Medline]. Sandler SG, Mallory D, Malamut D, Eckrich R. IgA anaphylactic transfusion reactions. Transfus Med Rev. 1995 Jan. 9 (1):1-8. [Medline]. Sandler SG, Eder AF, Goldman M, Winters JL. The entity of immunoglobulin A-related anaphylactic transfusion reactions is not evidence based. Transfusion. 2015 Jan. 55 (1):199-204. [Medline]. Shimada E, Odagiri M, Chaiwong K, et al. Detection of Hpdel among Thais, a deleted allele of the haptoglobin gene that causes congenital haptoglobin deficiency. Transfusion. 2007 Dec. 47(12):2315-21. [Medline]. Choi G, Soeters MR, Farkas H, et al. Recombinant human C1-inhibitor in the treatment of acute angioedema attacks. Transfusion. 2007 Jun. 47(6):1028-32. [Medline]. The 2011 National Blood Collection and Utilization Survey Report. Report of the US Department of Health and Human Services. Available at http://www.hhs.gov/ash/bloodsafety/2011-nbcus.pdf. Accessed: October 9, 2017. Popovsky MA, Moore SB. Diagnostic and pathogenetic considerations in transfusion-related acute lung injury. Transfusion. 1985 Nov-Dec. 25(6):573-7. [Medline]. Kopko PM, Popovsky MA, MacKenzie MR, et al. HLA class II antibodies in transfusion-related acute lung injury. Transfusion. 2001 Oct. 41(10):1244-8. [Medline]. Weber JG, Warner MA, Moore SB. What is the incidence of perioperative transfusion-related acute lung injury?. Anesthesiology. 1995 Mar. 82(3):789. [Medline]. Silliman CC, Boshkov LK, Mehdizadehkashi Z, et al. Transfusion-related acute lung injury: epidemiology and a prospective analysis of etiologic factors. Blood. 2003 Jan 15. 101(2):454-62. [Medline]. [Full Text]. Blajchman MA. Protecting the blood supply from emerging pathogens: the role of pathogen inactivation. Transfus Clin Biol. 2009 May. 16(2):70-4. [Medline]. [Guideline] Carson JL, Grossman BJ, Kleinman S, Tinmouth AT, Marques MB, Fung MK, et al. Red blood cell transfusion: a clinical practice guideline from the AABB*. Ann Intern Med. 2012 Jul 3. 157 (1):49-58. [Medline]. [Full Text]. Looney MR, Roubinian N, Gajic O, Gropper MA, Hubmayr RD, Lowell CA, et al. Prospective study on the clinical course and outcomes in transfusion-related acute lung injury*. Crit Care Med. 2014 Jul. 42(7):1676-87. [Medline]. Eder AF, Kennedy JM, Dy BA, et al. Bacterial screening of apheresis platelets and the residual risk of septic transfusion reactions: the American Red Cross experience (2004-2006). Transfusion. 2007 Jul. 47(7):1134-42. [Medline]. Blajchman MA, Beckers EA, Dickmeiss E, et al. Bacterial detection of platelets: current problems and possible resolutions. Transfus Med Rev. 2005 Oct. 19(4):259-72. [Medline]. Barrett BB, Andersen JW, Anderson KC. Strategies for the avoidance of bacterial contamination of blood components. Transfusion. 1993 Mar. 33(3):228-33. [Medline]. Dzieczkowski JS, Barrett BB, Nester D, et al. Characterization of reactions after exclusive transfusion of white cell-reduced cellular blood components. Transfusion. 1995 Jan. 35(1):20-5. [Medline]. Pineda AA, Taswell HF. Transfusion reactions associated with anti-IgA antibodies: report of four cases and review of the literature. Transfusion. 1975 Jan-Feb. 15(1):10-5. [Medline]. Oakley FD, Woods M, Arnold S, Young PP. Transfusion reactions in pediatric compared with adult patients: a look at rate, reaction type, and associated products. Transfusion. 2015 Mar. 55 (3):563-70. [Medline]. Vaccines, Blood & Biologics: Fatalities Reported to FDA Following Blood Collection and Transfusion: Annual Summary for Fiscal Year 2012. U.S. Food and Drug Administration. Available at http://www.fda.gov/BiologicsBloodVaccines/SafetyAvailability/ReportaProblem/TransfusionDonationFatalities/ucm346639.htm. Accessed: October 15, 2014. Hillyer CD, Josephson CD, Blajchman MA, et al. Bacterial contamination of blood components: risks, strategies, and regulation: joint ASH and AABB educational session in transfusion medicine. Hematology Am Soc Hematol Educ Program. 2003. 575-89. [Medline]. [Full Text]. Beauregard P, Blajchman MA. Hemolytic and pseudo-hemolytic transfusion reactions: an overview of the hemolytic transfusion reactions and the clinical conditions that mimic them. Transfus Med Rev. 1994 Jul. 8(3):184-99. [Medline]. Yu H, Sandler SG. IgA anaphylactic transfusion reactions. Transfus Med Hemother. 2003. 30:214-20. Farkas H, Jakab L, Temesszentandrasi G, et al. Hereditary angioedema: a decade of human C1-inhibitor concentrate therapy. J Allergy Clin Immunol. 2007 Oct. 120(4):941-7. [Medline]. Vichinsky EP, Earles A, Johnson RA, et al. Alloimmunization in sickle cell anemia and transfusion of racially unmatched blood. N Engl J Med. 1990 Jun 7. 322(23):1617-21. [Medline]. Shariatmadar S, Pyrsopoulos NT, Vincek V, Noto TA, Tzakis AG. Alloimmunization to red cell antigens in liver and multivisceral transplant patients. Transplantation. 2007 Aug 27. 84(4):527-31. [Medline]. Castro O, Sandler SG, Houston-Yu P, Rana S. Predicting the effect of transfusing only phenotype-matched RBCs to patients with sickle cell disease: theoretical and practical implications. Transfusion. 2002 Jun. 42(6):684-90. [Medline]. Orlina AR, Sosler SD, Koshy M. Problems of chronic transfusion in sickle cell disease. J Clin Apher. 1991. 6(4):234-40. [Medline]. Habibi A, Mekontso-Dessap A, Guillaud C, Michel M, Razazi K, Khellaf M, et al. Delayed hemolytic transfusion reaction in adult sickle-cell disease: Presentations, outcomes and treatments of 99 referral center episodes. Am J Hematol. 2016 Jun 27. [Medline]. Baumgarten A, Kruchok AH, Weirich F. High frequency of IgG anti-A and -B antibody in old age. Vox Sang. 1976. 30(4):253-60. [Medline]. Hong H, Xiao W, Lazarus HM, Good CE, Maitta RW, Jacobs MR. Detection of septic transfusion reactions to platelet transfusions by active and passive surveillance. Blood. 2016 Jan 28. 127(4):496-502. [Medline]. Eder AF, Dy BA, Herron RM, et al. Effective reduction of TRALI risk with plasma collected predominately from male donors [abstract]. Transfusion. 2009. 49 (supp):45a. Palavecino E, Yomtovian R. Risk and prevention of transfusion-related sepsis. Curr Opin Hematol. 2003 Nov. 10(6):434-9. [Medline]. Ezidiegwu CN, Lauenstein KJ, Rosales LG, Kelly KC, Henry JB. Febrile nonhemolytic transfusion reactions. Management by premedication and cost implications in adult patients. Arch Pathol Lab Med. 2004 Sep. 128(9):991-5. [Medline]. [Full Text]. Mekontso Dessap A, Pirenne F, Razazi K, Moutereau S, Abid S, Brun-Buisson C, et al. A diagnostic nomogram for delayed hemolytic transfusion reaction in sickle cell disease. Am J Hematol. 2016 Dec. 91 (12):1181-1184. [Medline]. [Full Text]. Delaney M, Wendel S, Bercovitz RS, Cid J, Cohn C, Dunbar NM, et al. Transfusion reactions: prevention, diagnosis, and treatment. Lancet. 2016 Dec 3. 388 (10061):2825-2836. [Medline]. Noizat-Pirenne F, Habibi A, Mekontso-Dessap A, Razazi K, Chadebech P, Mahevas M, et al. The use of rituximab to prevent severe delayed haemolytic transfusion reaction in immunized patients with sickle cell disease. Vox Sang. 2015 Apr. 108 (3):262-7. [Medline]. Bluemle LW Jr. Hemolytic transfusion reactions causing acute renal failure. Serologic and clinical considerations. Postgrad Med. 1965 Nov. 38(5):484-9. [Medline]. Tinegate H, Birchall J, Gray A, Haggas R, Massey E, Norfolk D, et al. Guideline on the investigation and management of acute transfusion reactions Prepared by the BCSH Blood Transfusion Task Force. Br J Haematol. 2012 Oct. 159(2):143-53. [Medline]. [Guideline] Canadian Blood Services. Clinical Guide to Transfusion Medicine. Available at http://www.transfusionmedicine.ca/sites/transfusionmedicine/files/articles/CGTTChapter10_MAY2011_FINAL.pdf. 2013; Accessed: July 8, 2016. Davenport RD. Management of transfusion reactions. Mintz PD, ed. Transfusion Therapy: Clinical Principles and Practice. 3rd ed. Bethesda, Md: American Association of Blood Banks Press; 2010. 757-84. The views expressed in this article are those of the authors and do not necessarily reflect the official policy or position of the Department of the Navy, Department of Defense, nor the U.S. Government.